Here is yet another one of my favorite spinach salad combinations – apples , Gorgonzola cheese, and walnuts. For a sweeter taste, you can candy the walnuts! (optional) To Make Candied Walnuts. Place walnuts and sugar in a skillet over medium heat. Stir continuously until the sugar dissolves into a light brown liquid and coats the walnuts. Remove the walnuts and spread over foil. Once they are cool, break apart in pieces. This recipe only needs 1/2 cup candied walnuts, so you can store the other 1/2 for use later on. 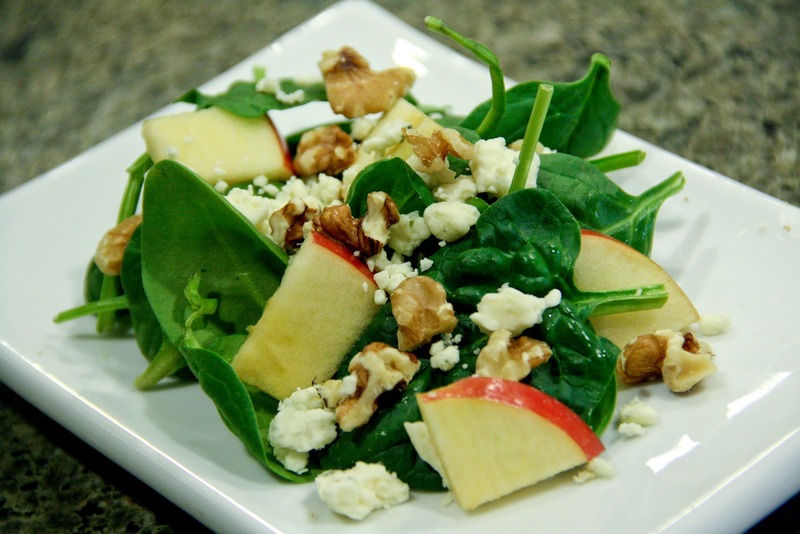 Divide the spinach leaves into the salad bowls/plates.Toss with apples. 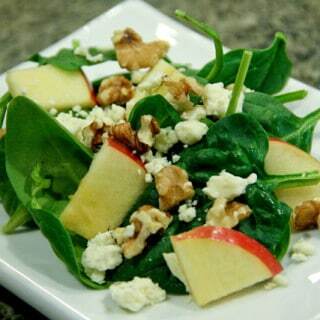 Sprinkle with walnuts and Gorgonzola cheese. Mix the olive oil, balsamic vinegar, and white sugar in a small bowl (the measurements given are for about 3 bowls of salad, so adjust amounts accordingly). Drizzle each plate with some of the dressing and serve. The amount of ingredients will depends on how many people you have and how much salad you tend on serving them. The important thing for me is that this is a good combination of flavors. I only toss all these ingredients into one large salad bowl if I'm serving more than 4-6 people. If I'm serving less, I like to compose each salad bowl individually.